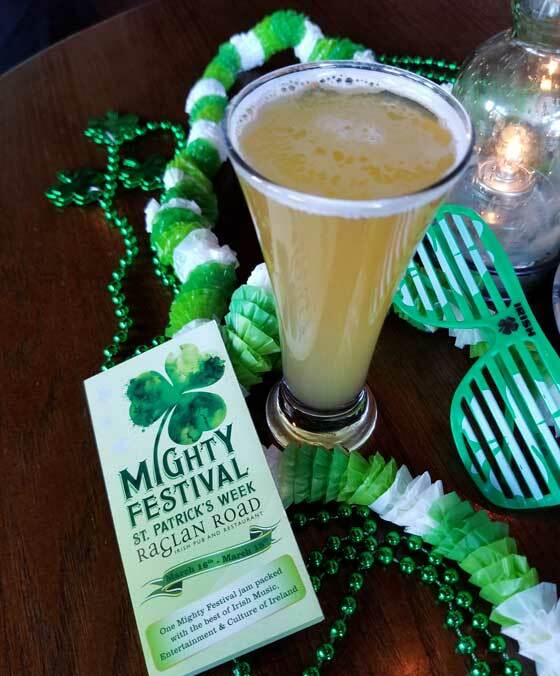 We were invited to the media preview of The Mighty Festival at Raglan Road Pub which runs tonight through Saturday to celebrate the St. Patrick’s Day holiday. 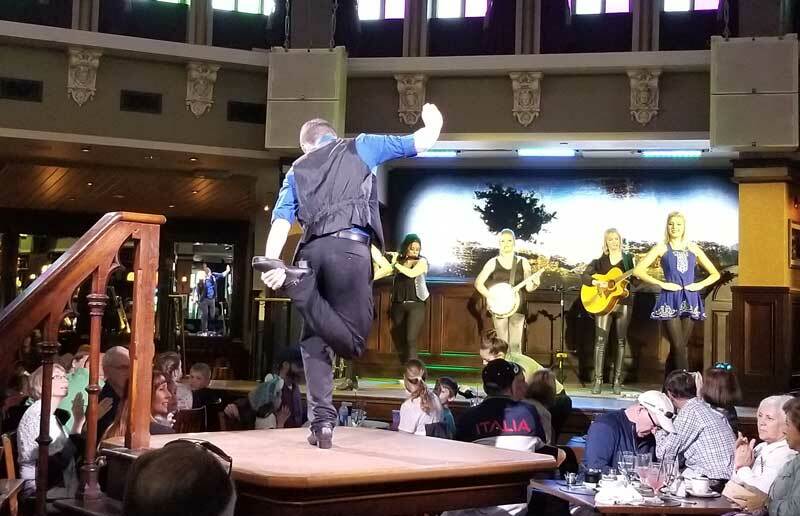 As you might expect from an authentic Irish pub there is fantastic music, terrific traditional dancing, beers worth trying, and food that elevates the pub experience to new heights. Did you recognize that song at the end? The Shepherd’s Pie was a tomato based, almost a salsa, mix of beef and lamb and tasty mashed potatoes on the top and gravy on the side. 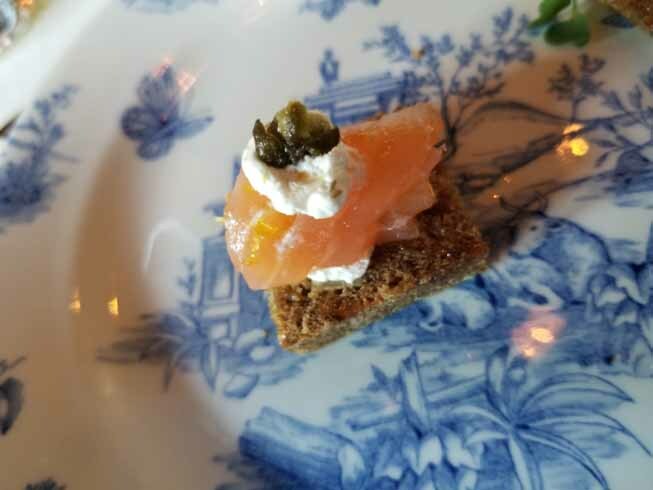 The Salmon Swoon is Irish smoked salmon perched lovingly on a slide of soda bread with a bit of flavored cream cheese. It was quite good, don’t knock soda bread either. 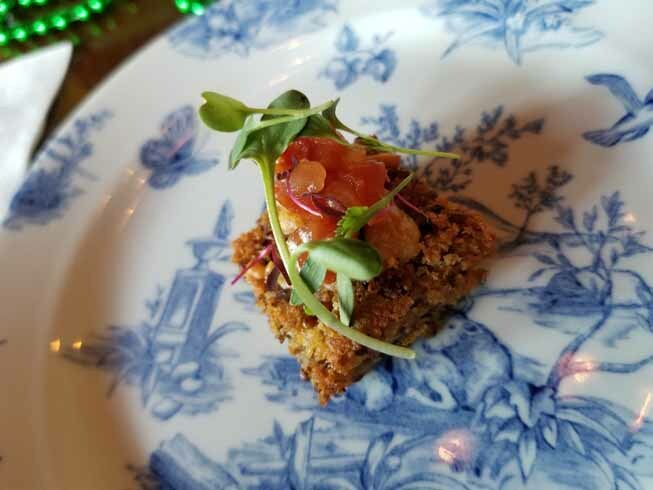 They also served us a quinoa patty with a tomato salad. It’s great for those in your party who are looking for a vegetarian or vegan offering. It wasn’t on the limited media menu we were given, so you may have to ask for it. 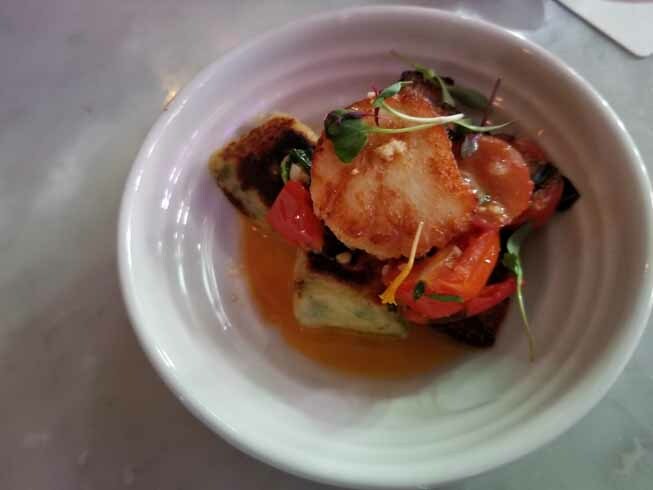 The Gnocchi served with George’s bank scallops and crispy pork belly and a lovely tomato and kale salad with white wine butter sauce. We loved this dish, especially when taken as a whole. Not photographed are the traditional fish & chips served in a traditional paper bag. They were quite good, as always, with or without the tartar sauce. The star of the show at Raglan Road Pub as far as food is concerned is the Rack of Heaven ribs. 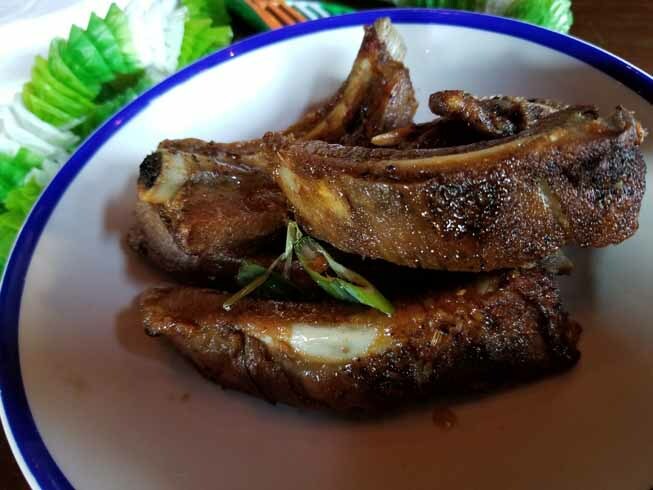 The slow roasted Guinness glazed baby baby ribs are seasoned and cooked perfectly. It’s the animal kingdom equivalent of candy. 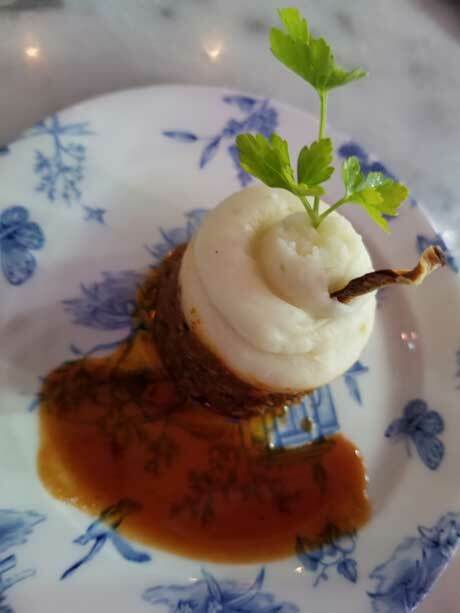 We’ve bought the sauce and tried to recreate these at home with no luck, so you have to come to Raglan Road to get these delicious bites. If you like ribs, get these. We also sampled a trio of desserts. Flourless Chocolate cake (we were told it’s also Dairy-Free but you may want to confirm yourself) was up first. It was a little rubbery like a sponge cake and had a mild chocolate flavor. 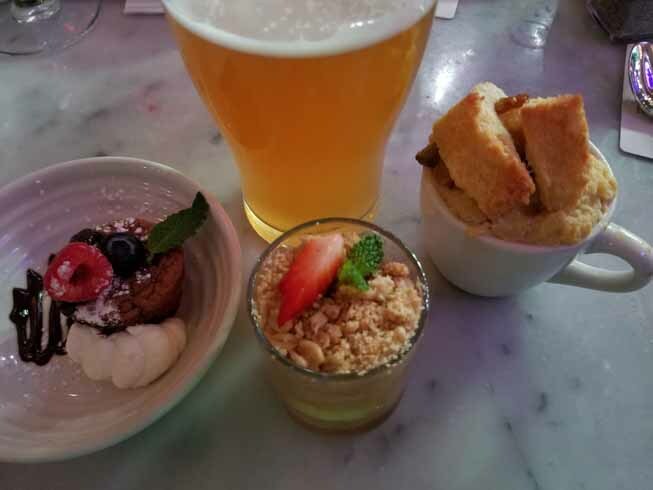 The other two were served warm, the apple crumble was like a warm apple pie in a jar and the bread pudding was missing its butterscotch sauce, but was very good just the same. It would be practically illegal with the sauce. Raglan Road also shared with us a new beer on their menu. It’s called King of Shoals and it’s a New England IPA from Crooked Can Brewing Company. We found it to be on the light side for an IPA, which makes it a good beer for someone who is not really into beers. The bitterness is on the low end for an IPA and it has nice tropical fruit characteristics. It’s nice to see Raglan Road serving beers from Florida breweries and we’ll be back to support them again. We hope you’ll get yourself to Raglan Road Pub at Disney Springs for their St. Patrick’s Day week Mighty Festival. 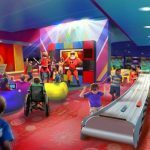 The food, the dance, the drinks, and the fun are not to be missed.